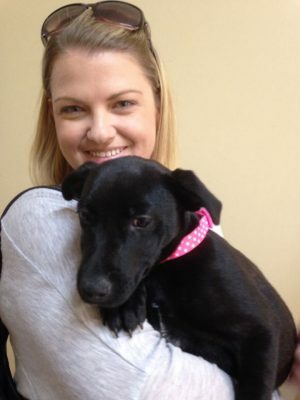 Luna found a wonderful new home with Emily. The Gunnedah Veterinary Hospital in conjunction with the Gunnedah Shire Council established the Pound Adoption Scheme in 2005. Under this scheme, impounded dogs/ puppies and cats/ kitten that are due for euthanasia (ie their owners have not come forward for them) are kept by the Hospital and assessed for temperament and suitability. Once deemed appropriate they are de-sexed, vaccinated, wormed, flea treated, microchipped and the dogs are registered with the council before they are rehomed to loving new homes for a small rehomer fee to help cover their treatment costs. Since the inception of this scheme, over 300 pets have been saved! We are now in the fortunate position of having a waiting list of people to call for our Pound Rehomers meaning that most of them never make it into the paper. So if you are interested in giving a Pound Rehomer a loving home and a new start in life, please leave your details with reception and we will be sure to contact you as soon as a suitable pet comes in. GVH runs a rehoming scheme with Gunnedah Council/ Pound so we constantly have animals that require loving homes. Please contact GVH to find out what pets we currently have for adoption or check out our Facebook page! Please phone our main telephone number 02 6742 1834 and the answering machine will direct you to the a mobile number of the Veterinarian that is on call.